I am about to install (6) 180W Grape Solar panels with a Magnum PT-100 controller on my motorhome (9.15 amp, 24.06 VOC). I was going wire them all in series. Anyone see a problem with that configuration? I decided on wiring them all in series after talking with a Magnum technician who said that a 2X3 or 3X2 configuration would be delivering minimum voltage to the controller which might cause error codes. Does that make sense? Also after reading a jillion posts on it, I'm still uncertain about what gauge wire would I need. What is the voltage of your battery bank? It is sort of difficult to find the Vmp/Imp rating of these panels... They appear to be 36 cell panels which would put Vmp~18 volts. A perfectly good "12 volt" panel if used with a PWM supply on a 12 volt battery bank (or higher voltage if put in series). For MPPT type charge controllers, you need to look at the ratings needed to operate your MPPT controller... Specifically, the MPPT operating range and the Vpanel never to exceed voltage. Solar panels are "imperfect batteries"... Their operational voltages (Voc voltage open circuit and Vmp voltage max power) fall as their cell temperature rises, and increases as the cell temperatures fall. So, you need to look at the Vmp-array range for the controller... Typically Vmp-array-hot --- As Vmp falls as the array is in noontime sun in a hot/windless day. For for Voc which rises in cold weather, you need to make sure your Voc-array-cold does not exceed the the Vpanel-max for the controller. Which is still over the 77 volts Vmp-min needed for a 48 volt battery bank. All is good there. You also need to look at the Voc-cold for these panels... On the next page of the manual, are the calculations needed for both Vmp and Voc vs Temperature calculations. But just from looking at your Vmp and Voc panel ratings, you do not have any issue with Voc-cold and the 188 Volt shutdown voltage. The NEC (national electric code) allows 15 amps on a 14 AWG cable (with proper insulation, etc.). And if the cable is exposed to sunlight, it needs to be UV/Weather rated cable too. The other calculation is how far is it from the array to the charge controller/battery? Longer wire runs, you want heavier cable so you have less losses. Typically we design for 1% to 3% maximum voltage loss. Note that placing all off your panels in series allows you to run much smaller (cheaper) copper cable from the array to the battery bank--One of the major reasons to "like" MPPT controllers and running "higher voltage" solar arrays. So, how far is it from the array to the controller? One potential issue is if you have any vent stacks, antenna, etc on the RV roof that could cause any shading. Even a thin shadow from an antenna or overhead wire near one panel can substantially reduce output for the whole string. Does anyone have information on these Grape panels? They seem to be missing the standard ratings and information that we see on solar panels (no Voc/Vmp/Ioc/Imp, no NRTL, etc.). The use of a blocking diode (nobody does that any more, unless is translation issue and they are using by-pass diodes--Which are very much needed in this series array application). 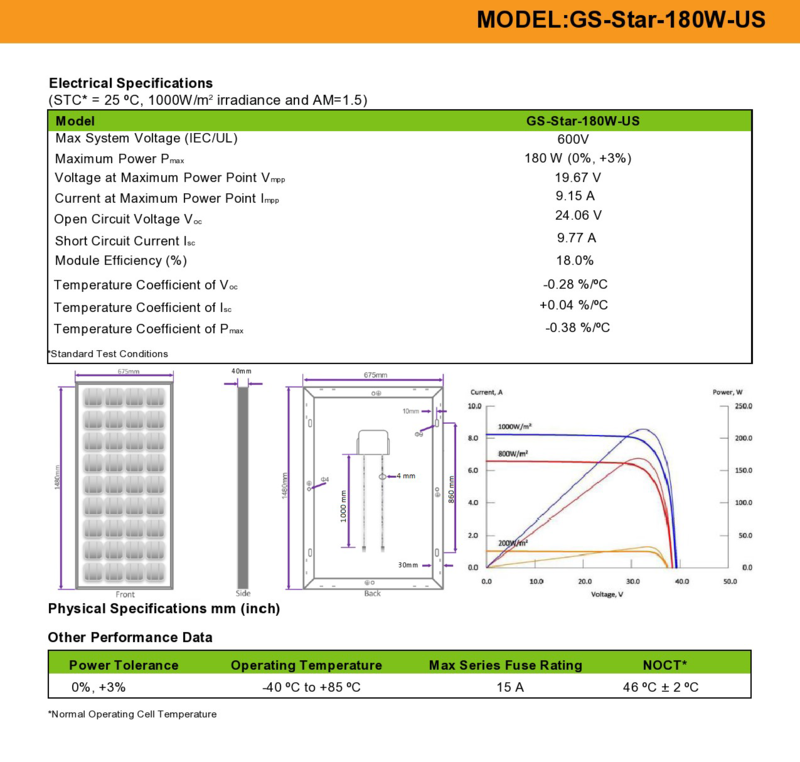 At this point, I would be buying another brand/model of panels unless there is a data sheet out there with the missing information/clarifications on diodes. Wow. Great info! That is so helpful. And it's good to hear that I seem to be on the right track. It is a 12v system. The cable will be about 20-25' (say 30 to be sure).. I was looking at some wiring calculators and that seems to come out to about an 8 AWG cable? If you ever add more panels (Larger array), you could install the heavier cable now, and just add another parallel string (or many, with a combiner box) down the road. High transmittance, low iron tempered glass with enhanced stiffness and impact resistance. Bypass diodes good. Blocking diodes not needed and usually not wanted.